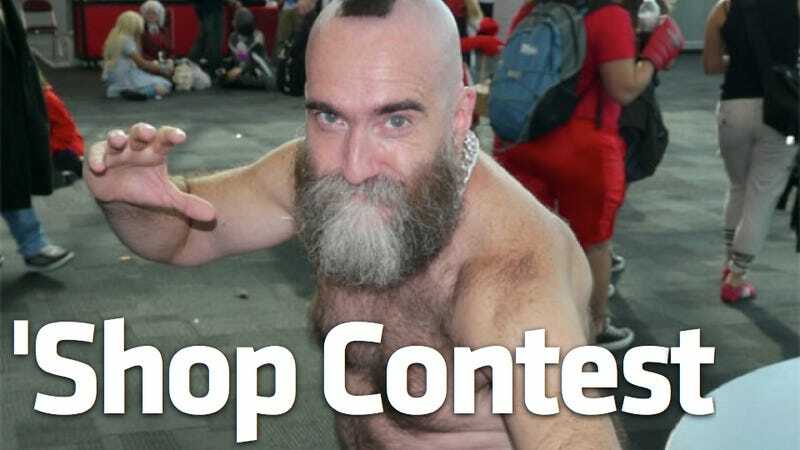 Zangief won Mr. Stonewall Bear 2011 this past week, giving new meaning to the term "screw piledriver." It was good that he shaved off his backhair, because we're about to get 200 new looks at him in this week's 'Shop Contest! In case you're curious who today's victim is, that's Mike Fass, who portrayed Zangief in College Humor's "Street Fighter: The Later Years" back in 2006. What he's doing in a pageant for manly men, who can tell, but he won it all and here we are. Alright, the image we're using is not the one above. Instead we've got a much more exploitable pose, from this gallery. Source Image: Zangief Wins the Bear Contest. Alright, this one doesn't need any overthinking. Get to it! I'm already looking forward to the results.